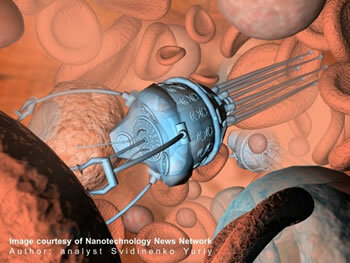 Artist Svidinenko Yuriy has been reading Robert A. Freitas' book on nanotechnology and the future of medicine. Although, as he admits, these pictures are only "simple imagination study" and not "full-technical calculated design" - they're still cool. 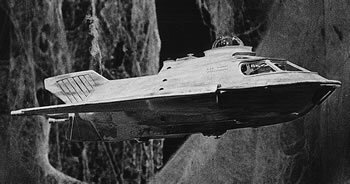 Up until now, the best we had to go on for designs of small repair ships cruising the bloodstream was the ship from Fantastic Voyage. I think I can see Raquel Welch driving this thing, can't you? A very small Raquel Welch, of course. Possibly with diamondoid earrings. From Cell Repair Nanorobots; original pointer from KurzweilAI.net. Be sure to check out the retro images at Nanomedicine Art Gallery.